Price Paid: 60 bucks....so I can't complain. Was a little disappointed with this jacket. Enjoying a beverage in the Eddie Bauer Microtherm. Which is a bummer because I was really looking forward to this article of clothing. I have had it for two months and have taken it on some pretty good backpacking trips that ranged anywhere from 1-5 days. The temps I have had it in ranged from 4 degrees F to 55 degrees F and I have layered with it and used it solo. It has literally fulfilled every role. The fit on this jacket is spot on for someone of my stature and personal preferences. It is not to tight, yet it is not to loose. 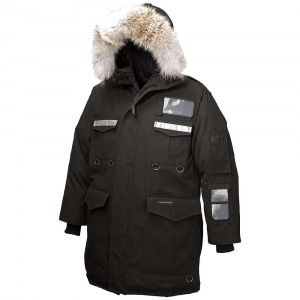 The sides are well tapered and stay in place when the jacket is in action. No twisting, no kinking, and very little play overall. It is very well structured. One thing that I really enjoy is the breathability. This jacket breathes. It breathes so well it caught me off guard for a down jacket. And as there is no escaping moisture buildup in spots, it is nice to know the down has been treated with a nice DWR coating and can retain some of its heat. Unfortunately, the shortcomings outweigh the positives of this jacket. Almost every time I take it off, I am disappointed. This jacket leaks feathers like a Harley Davidson leaks oil. It is a sad sight to see your insulation floating in the air and covering up other articles of clothing, especially on whatever you were wearing underneath the jacket. A few feathers here, a few feathers there....every single time. And the threading! Man this is poor craftsmanship. Unexpected from Eddie Bauer. Long story short, yes, this jacket looks good, yes, it keeps you warm while doing outdoor activities, and yes, it is poorly made. Look elsewhere. Too bad it's a lousy jacket. It sure looks good. Hi yes I did contact Eddie Bauer and was happily set up with a new one. Actually an upgraded one. Big kudos to Eddie Bauer's customer service. Will give an update on the new one in a few months. Sounds good, Rob. Yes, please let us know how the new one works out after a while. A layering piece for anyone that wants to shave some weight by not carrying a fleece midlayer. 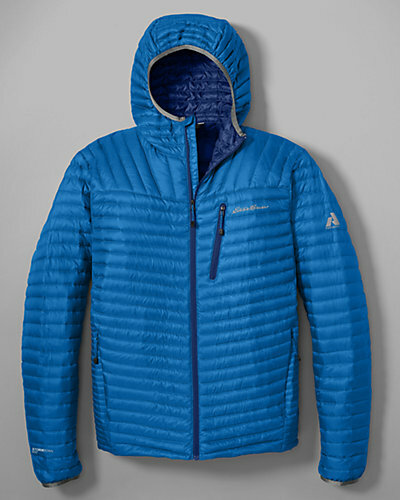 This could replace a fleece, but will not move moisture away from you like a fleece. I had this jacket twice. The first one I had to use the excellent EB warranty after two months because the very end of the zipper tab broke, rendering my zipper useless. It is lightweight plastic instead of metal. This shaves weight but sacrifices durability. The next one that I had I used for about a week. 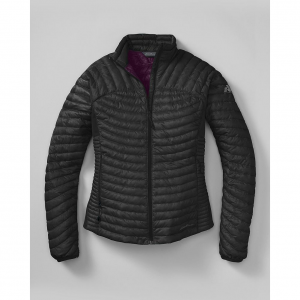 The reason that I returned it and bought instead the EB Downlight Sweater was this, this jacket is good as a layering piece in similar temps where you might usually want to wear a Capilene midweight or fleece midweight layer. Although during heavier activities it caused me to sweat quite a bit more than if I were layering with fleece. Once I would begin to sweat I felt that I just stayed wet under this layer. First I had the older model that lacked the DWR treated down, and that would wet out quickly once I started to sweat. The second model I had was the 2015 model with the DWR treated down. This upgrade did seem to make a difference in loftiness being in the loftier range when I was sweaty. But there were a couple of reasons I would still feel cold once I started to perspire. The first being that there was no cinch at the waist on this jacket. There wasn't elastic at the waist either. I tried both a large and extra large and I would get gusts of wind, up the waist whenever there was a windy day. The other reason was that once this jacket did become fairly sweaty, it began to just feel like the moisture wasn't going anywhere. 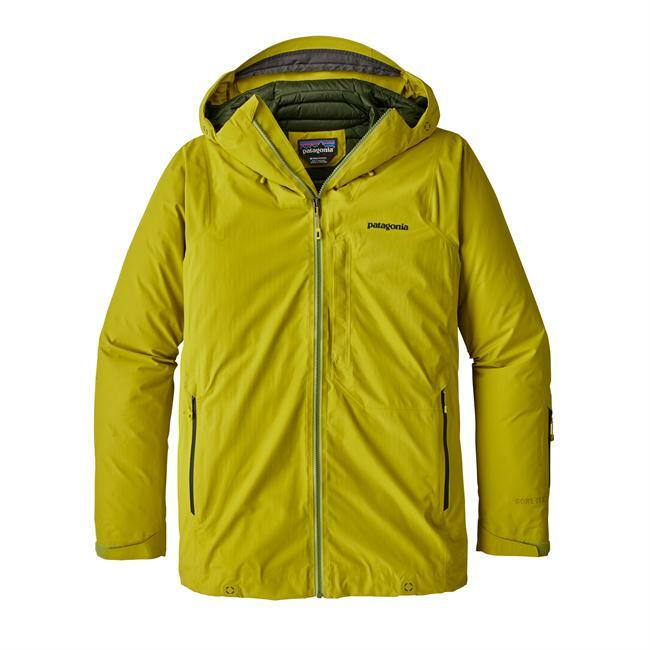 I have had other coats where I can see the moisture on my back on the outside of outer shell fabric, which has left me drier and feeling warmer. This was not the case with this jacket. Construction is fair for the price range if the item is purchased on sale. 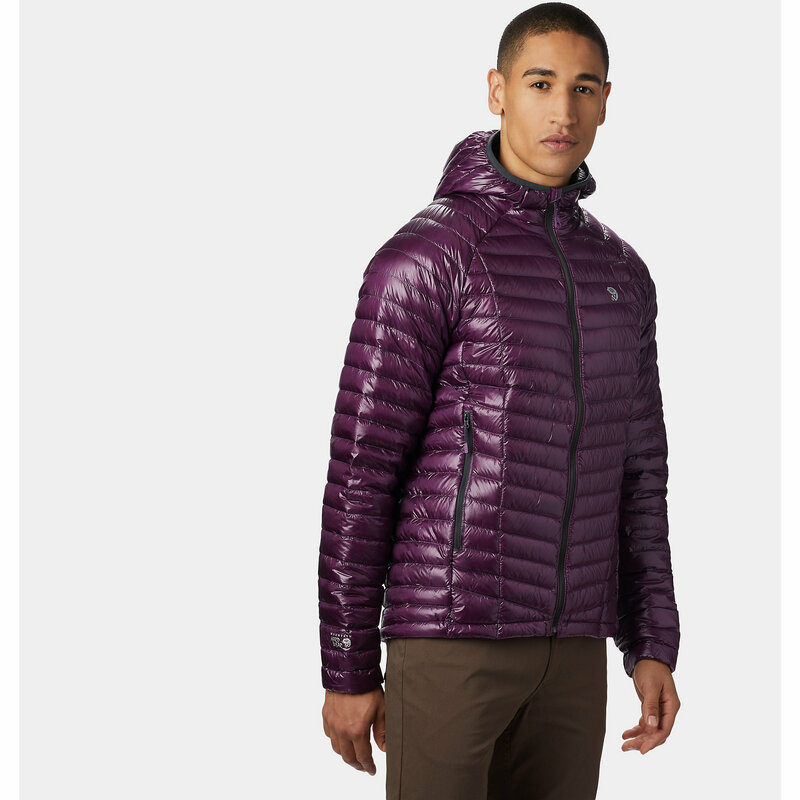 I really feel that in the case of this jacket you are likely going to use the EB warranty on this product within one season. Which may be fine for some people, maybe not for others. I was really gentle on the lightweight zipper and it still broke. I had a couple of stitches that were off their intended mark, in places that most consumers wouldn't notice. One being near the bottom of the garment on the inside, and one being near the inside of the right armpit. I did also find at least a few baffles in the arms that appeared to not have any down fill in them. The down fill in the arms also seemed to migrate to the outer part of the arms and leave the inside of the arm with less fill. Water resistance on the outer shell was great in snowfall. I never felt like the jacket was getting wet from the outside. I never wore it in the rain. Warmth on the jacket was moderate. As long as I didn't break a sweat I was comfortable. I wore the jacket in temperature ranging from 40 degrees f to -15 degrees f.
The jacket's outer shell when I had it didn't seem to show any signs of abrasion. I was wearing this mostly for work outdoors, and not always carrying a pack. Pockets all functioned as intended. The hand pockets on the side are unlined and the zippers worked well to stay closed. The single chest pocket stays zipped well and features a small hole to pass a headphone cord, I never used this pocket to stow my phone because it would end up sweaty. The wrists featured an elastic on the ends, but somehow always still let wind up the arm. I thought that moving from an XL to a large would reduce the wrist size but it didn't seem to. The things that I would want to see this jacket improve on for me to consider owning it again would be easy to change. First, I would like to see some elastic in the waist or a very light shock-cord cinch that would not add much weight to the jacket. I would like to see all baffles containing down fill. I would also like to see a slightly more "breathable" or moisture wicking inner shell material. Lastly, I would like to see an upgrade to the zipper. Not one much larger, but just the addition of a piece of metal at the bottom tab so that it would be a little more durable. The last thing you would want to happen on a thru-hike would be for your zipper to fail on your puffy. 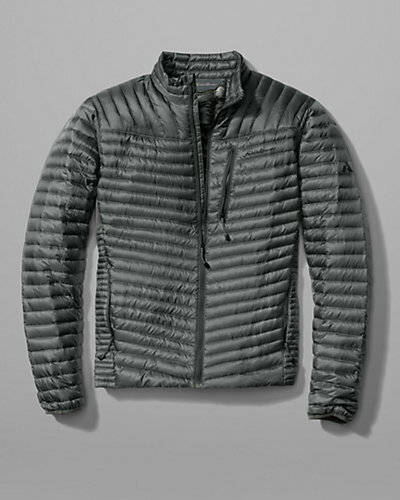 If Eddie Bauer made these changes I think the MSRP of $199.99 would be more realistic since it is competing with products like the Patagonia Nano Puff or Down Sweater (when they are on sale) and overall the product would be better. 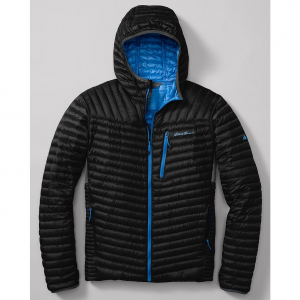 The Eddie Bauer MicroTherm StormDown Jacket is not available from the stores we monitor. It was last seen July 25, 2016	at Eddie Bauer.